Show that building you mean business. We spent the past weekend playing PunchBox Studios' free-to-play iOS title, Pocket Climber, and saying we're addicted is one way of putting it. Quite frankly, we can't put the game down, and you'll probably run into the same delightful problem as soon as you get your hands on it. That said, here's a Pocket Climber cheats and tips guide that'll help you ascend the building with ease. Listen, there are more than enough gold coins in this game to go around, so don't do something silly, like go for the coin directly beneath an elevator. More often than not, you'll die. At the end of the day, all coins have the same value. Whenever you see a window spring open, that means some computer-controlled bozo is about to chuck a random object into the air, be it TV, couch or fire extinguisher. Don't wait to see what it is. Instead, immediately move out of harm's way to avoid getting hit. 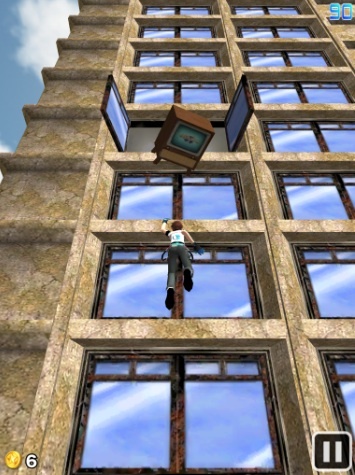 Pocket Climber is one of those games where something happens every second or so, which means there is no time to remove your eyes off the action to answer the phone or take a quick glance at the TV. Doing this is extremely hazardous to your climber's health. Keep an eye on the constantly changing terrain and plot your next move(s). Not only does this prove useful in collecting more gold coins, but also for staying alive. By doing this, you cut down on the number of surprises. Although characters auto climb, a few areas will be too high to reach. When you see a wall or patio full of boxes, wait until your climber grabs the closest ledge, then swipe up to jump. Upon dying, the game will ask if you want to continue from where the climber croaked. At first, this seems like a great idea, until you realize it costs precious coins to make it happen. Our advice? Just restart from the beginning, which leads us to our next tip. Once you've amassed a sizable number of coins, visit the Store and pick up some power-ups, like a helmet to protect against hazards, a coin magnet to attract loot and a jetpack to give you a boost. On top of that, you can upgrade each piece of equipment to make it more efficient. Coins for sale. Get your red-hot coins over here.